When summer outfits need a little snazzing up, playful accessories are the ticket. 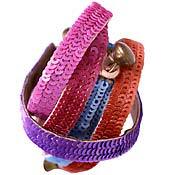 These sequined leather bracelets, available in 25 colors, will make your wrists so sparkly the rest of your body might get jealous. An eyelet clasp makes them easy to get on and off—and at the bargain price of $4, you’ll want an armful.